My Grandfather enlisted in the Australian Army in October 1916 to serve in the First World War - 'The Great War' as it was dubbed. He wrote in his diary everyday. 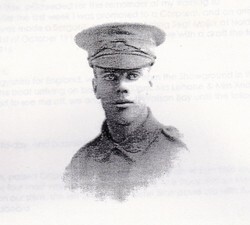 My grandfather was an Englishman, but found himself in Australia in 1916 during the First World War. His wife and two children were back in London and he decided to join the Australian Army and fight in the war. He was sent to Flanders and The Somme and wrote in his diary every day of the war until he was discharged from the army in May 1919. I am writing a book about my 'Pop's' experiences based on his diary This article gives an insight into his particular and very succinct way of recording his war experiences. My Grandfather ('Pop') was a signaler and had to run phone wires through the front lines and many times was under heavy fire. My 'Pop' saw the virgin statue on the Tower of the Albert Cathedral first hand. This virgin is in many photographs of the First World War and to think that my own grandfather was actually there in 1918 when it finally fell makes my heart swell with emotion. He writes in his diary on Friday 12th April 1918 "We had a very good night here, although we are in open trenches, we are on a high hill overlooking Albert, Aveluy and Martinsart, the Virgin on the Cathedral is still in the same position. We expect to be relieved tomorrow night." Later on Saturday April 20th he wrote "On the phone from 1am to 4am, the Albert Cathedral Tower at Albert can be seen from here. The Virgin was knocked down 4 days ago. Enemy artillery very active this morning". On Monday 22nd April 1918 there was a very remarkable entry in my 'Pop's' diary. "Fairly quiet this morning, but was very active this afternoon. Shells dropping all around here. Two of the Fifth Division Machine gunners in the right of us brought down Baron Von Richthofen and his plane. He has accounted for 98 of our planes. There was a push by the Tommies (British soldiers) on our left this evening on a 3 kilometer front. They had to advance to the next ridge some considerable distance away and they were successful and took 200 prisoners. The artillery fire on our front was very wild. Cpl R (my grandfather writes his proper name in his diary but I will just use his initial) and I were out forward and had to mend two brakes in the wire during the bombardment. Cpl M was killed this evening." My Grandfather (Pop) was in his early twenties during this hellish ordeal that he endured for three years. I have read his diary many times and never cease to be amazed at his discipline to state just the facts and to be precise about many things. I hope that I will be able to do justice to his great service when I write the book of his exploits and observations. He was wounded by shrapnel on 28th August 1918 and his dear younger brother was killed in action on 1st September 1918. War to me is such a totally devastating event both to people, property and the soul of humankind, however, the bravery and commitment to the perceived cause that the military men and women gave bears telling and documenting. My Pop died in 1976 in his eighties and he was a wonderful, kind and gentle man and I am proud that he served his country and survived!